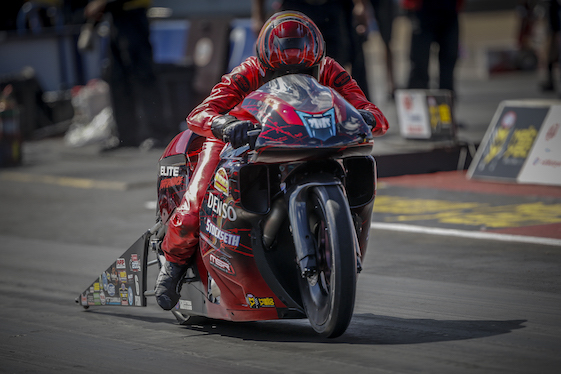 Smith covered the famed quarter-mile in Southern California in a track-record speed at 200.65 mph at 6.774-seconds aboard his Elite Motorsports DENSO Auto Parts EBR to claim the provisional pole. The quickest rider in both sessions and third member of the 200 MPH Club, Smith is one of six competitors mathematically eligible for the2018 NHRA Mello Yello Drag Racing Series title. Based on two playoff wins through the first five Countdown to the Championship events, Smith began the weekend with a four-point lead over four-time/reigning world champion Eddie Krawiec. LE Tonglet and Hector Arana Jr. sat 61 and 64 points back, respectively. Meanwhile, 2016 world champion Jerry Savoie (101 points back) and five-time world champ Andrew Hines (113 points back) are the remaining contenders. “All in all, it was a good day for us,” said Smith, who won his Pro Stock Bike titles in 2007 and 2013. “We made two passes and were No. 1 for both runs. I got eight bonus points. We just have to go and win the race now and win the championship; no matter what anybody else tell us. Two-hundred (mph) is an extra plus.” Smith ended Friday with a nine-point lead over Krawiec. Leah Pritchett (Top Fuel), Tommy Johnson Jr. (Funny Car) and Jeg Coughlin Jr. (Pro Stock) also emerged as preliminary qualifiers at the season finale. Arana Jr., first rider in the 200 MPH Club, is second with his pass of 6.824-seconds at 198.96 mph aboard his Lucas Oil TV EBR. Tonglet, the 2010 world champion, is third via his run of 6.828 at 196.39 aboard his Nitro Fish Suzuki. Krawiec sits fifth after running 6.864 at 197.77 aboard his Screamin’ Eagle Vance & Hines Harley-Davidson Street Rod. Reigning world champion Brittany Force (Top Fuel), Johnson Jr. (Funny Car), 2017 world champ Bo Butner (Pro Stock) and Hines (Pro Stock Motorcycle) were last year’s winners of a race that will be televised on FOX Sports 1 (FS1), including three hours of live finals coverage starting at 4 p.m. (EST) on Sunday. Television coverage will begin on FS1 with one hour of “NHRA Sunday Live” at 11:30 a.m. and conclude with a 30-minute post-race show at 7 p.m.
Krawiec was the regular-season PSM point-leader and held the lead after the playoff opener at Maple Grove Raceway in Reading, Pa., but has had to make up ground in recent weeks. With four career wins at Pomona, Krawiec fully is capable of adding to his championship legacy. Arana Jr. jumped back into the conversation with his win at The Strip at Las Vegas Motor Speedway on Oct. 28, while Tonglet bumped Smith from the top spot after his victory at Texas Motorplex in Ennis, near Dallas. That was short-lived after Smith moved back into the point lead for a second time in the playoffs with his victory at zMAX Dragway in Concord, N.C., near Charlotte. Smith was in a similar high-pressure situation when he won his first title in 2007, beating Chip Ellis in the final round at Pomona to claim the title. On the strength of five consecutive Countdown wins, Steve Torrence claimed his first Top Fuel world title in Vegas and is looking to complete an improbable playoff sweep in Pomona. With his win in Vegas, Funny Car’s J.R. Todd opened the weekend with a 74-point lead over two-time/reigning world champ Robert Hight of John Force Racing. Todd, of Kalitta Motorsports, is chasing his first career world title. Second-year Pro Stock star Tanner Gray has scored seven wins in 2018, including two in the playoffs, and opened the weekend with a 140-point/seven rounds of racing lead over Jeg Coughlin Jr.
Southern California native Pritchett raced to the head of the Top Fuel class Friday with her 1,000-foot pass in 3.649-seconds at 329.34 mph in the Mopar Dodge dragster during the second session. Pritchett is seeking her fourth pole of the season and 11th of her career. Clay Millican sits second after his pass of 3.702-seconds at 327.19 mph in his Great Clips/Parts Plus dragster. Three-time world champion Antron Brown of DSR is third after his run of 3.704 at 329.50. Torrence provisionally is qualified fourth as he seeks to make history in his Capco Contractors/Torrence Racing dragster. In Funny Car, two-time/defending event champion Johnson’s second 1,000-foot run of 3.881-seconds at 328.54 mph sent his Make-A-Wish Dodge Charger R/T into the provisional top spot. Johnson, also of DSR, is seeking his fourth consecutive No. 1 qualifying position this season. DSR teammate “Fast” Jack Beckman, the 2012 world champ, is second after his pass of 3.901-seconds at 323.35 mph in his Infinite Hero Foundation Charger. Hight qualified third in his Auto Club of Southern California Chevrolet Camaro SS while Todd is in the No. 11 spot in his DHL Toyota Camry. If Todd captures the championship, he will become the first African-American driver to win a Funny Car title and just the second to win a major U.S. auto racing championship, joining fellow Toyota driver Brown. Todd also would be the second DHL Camry driver to win a Funny Car title in the last four years, joining Del Worsham, who won for Kalitta Motorsports in 2015. Todd has two victories and advanced to four final rounds during the first five Countdown events. He also has compiled a 16-3 round win/loss record during the playoffs. In Pro Stock, point runnerup Coughlin covered the traditional quarter-mile in 6.527-seconds at 211.39 mph in his JEGS.com/Elite Motorsports Chevrolet Camaro SS to grab the provisional pole. Teammate Erica Enders, a two-time world champion, is in the second spot after her pass of 6.530 at 211.39 in the Melling/Elite Performance Camaro. Championship leader Gray, who is exiting NHRA for a NASCAR career at season’s end, currently is fourth in his Gray Manufacturing Technologies Camaro. Top Fuel _ 1. Leah Pritchett, 3.649-seconds, 329.34 mph; 2. Clay Millican, 3.702, 327.19; 3.Antron Brown, 3.704, 329.50; 4. Steve Torrence, 3.704, 327.35; 5. Blake Alexander, 3.711, 330.88; 6. Billy Torrence, 3.711, 328.86; 7. Doug Kalitta, 3.740, 319.29; 8. Richie Crampton, 3.756, 319.52; 9. Scott Palmer, 3.767, 328.38; 10. Brittany Force, 3.772, 324.28; 11. Tony Schumacher, 3.792, 326.24; 12. Terry McMillen, 3.794, 325.61; 13. Shawn Reed, 3.858, 312.35; 14. Mike Salinas, 4.211, 208.20; 15. Cameron Ferre, 4.946, 144.75; 16. Audrey Worm, 7.731, 92.70. Funny Car _1. Tommy Johnson Jr., Dodge Charger, 3.881, 328.54; 2. Jack Beckman, Charger, 3.901, 323.35; 3. Robert Hight, Chevy Camaro, 3.936, 325.69; 4. Tim Wilkerson, Ford Mustang, 3.936, 305.29; 5. Ron Capps, Charger, 3.948, 320.66; 6. Shawn Langdon, Toyota Camry, 3.950, 320.97; 7. Courtney Force, Camaro, 3.965, 316.15; 8. Jim Campbell, Charger, 4.029, 307.30; 9. Ray Martin, Camry, 4.183, 259.31; 10. Bob Tasca III, Mustang, 4.217, 230.06; 11. J.R. Todd, Camry, 4.220, 310.13; 12. Terry Haddock, Mustang, 4.253, 260.56; 13. Matt Hagan, Charger, 4.256, 214.62; 14. Jeff Arend, Chevy Monte Carlo, 4.276, 255.15; 15. Bob Bode, Mustang, 4.346, 205.76; 16. John Force, Camaro, 4.386, 206.54. Not Qualified _ 17. Cruz Pedregon, 4.396, 204.14; 18. Jeff Diehl, 4.632, 190.35; 19. Jonnie Lindberg, 5.639, 122.74. Pro Stock_ 1. Jeg Coughlin Jr., Chevy Camaro, 6.527, 211.39; 2. Erica Enders, Camaro, 6.530, 211.39; 3. Jason Line, Camaro, 6.531, 211.56; 4. Tanner Gray, Camaro, 6.537, 209.59; 5. Matt Hartford, Camaro, 6.550, 211.39; 6. Alex Laughlin, Camaro, 6.550, 210.18; 7. Greg Anderson, Camaro, 6.557, 212.09; 8. Bo Butner, Camaro, 6.558, 211.03; 9. Chris McGaha, Camaro, 6.560, 211.89; 10. Drew Skillman, Camaro, 6.562, 211.43; 11. Deric Kramer, Camaro, 6.570, 210.50; 12. Alan Prusiensky, Dodge Dart, 6.590, 209.20; 13. Kenny Delco, Camaro, 6.612, 208.55; 14. Fernando Cuadra, Camaro, 6.615, 209.88; 15. Val Smeland, Camaro, 6.697, 207.27; 16. Joey Grose, Camaro, 6.738, 196.36. Not Qualified _17. Steve Graham, 7.091, 157.19; 18. Tom Huggins, 7.481, 142.03; 19. Vincent Nobile, 12.494, 71.25. Pro Stock Motorcycle _ 1. Matt Smith, EBR, 6.774, 200.65; 2. Hector Arana Jr., EBR, 6.824, 198.96; 3. LE Tonglet, Suzuki, 6.828, 196.39; 4. Jerry Savoie, Suzuki, 6.848, 194.74; 5. Eddie Krawiec, Harley-Davidson, 6.864, 197.77; 6. Joey Gladstone, Buell, 6.880, 196.30; 7. Chip Ellis, Harley-Davidson, 6.880, 194.80; 8. Hector Arana, EBR, 6.885, 197.57; 9. Scotty Pollacheck, Suzuki, 6.885, 194.49; 10. Andrew Hines, Harley-Davidson, 6.886, 194.60; 11. Ryan Oehler, Buell, 6.893, 196.64; 12. Angelle Sampey, Buell, 6.895, 193.40; 13. Steve Johnson, Suzuki, 6.898, 191.29; 14.Karen Stoffer, Suzuki, 6.952, 191.40; 15. Freddie Camarena, Suzuki, 6.953, 194.86; 16. Katie Sullivan, Suzuki, 6.978, 193.99. Not Qualified _ 17. Kelly Clontz, 7.013, 191.57; 18. Anthony Vanetti, 7.074, 188.94; 19. Angie Smith, 7.081, 163.63; 20. Maurice Allen, 7.114, 186.64; 21. Melissa Surber, Broke.